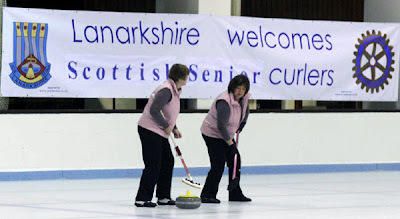 Four semifinals this morning at the Lanarkshire Ice Rink, Hamilton. 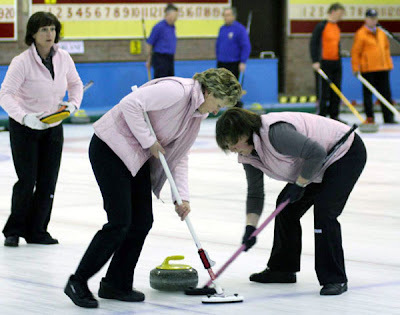 First to be decided made the home support happy, when Marion Craig, Rhona Fleming, Catherine Raeburn and Anne Malcolm beat Kay Gibb, Judith Carr, Rosemary Morrison and Kate Henderson, a stolen four in the fifth end sealing that game. 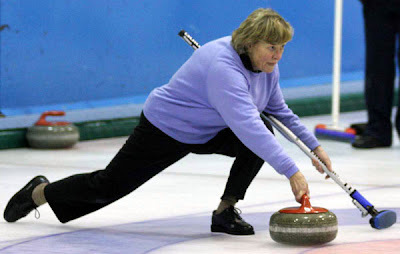 Jacqui Crawford hit and stayed to count a three in the sixth end of the other semi. 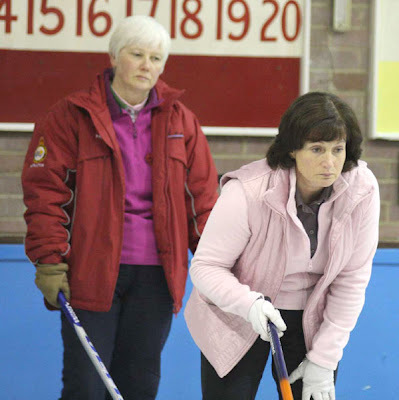 Although the teams played on for another end, Jacqui, Elaine Semple, Pat Ross and Fiona Macfarlane would have another match today. Janette Wilson, Norma Brown, Irene Hird and Maggie Mauchline would not. 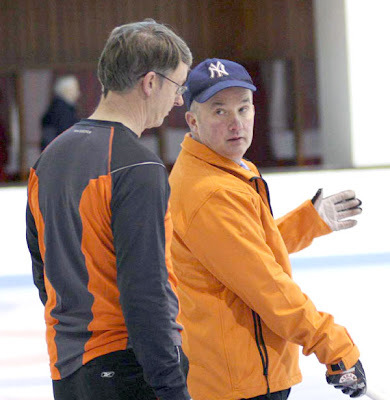 Keith Prentice made a double takeout to count four at the seventh end of his semifinal, and that prompted the handshakes from the Don Stark team of Gordon Mackie, Bill Allison and John Wallace. 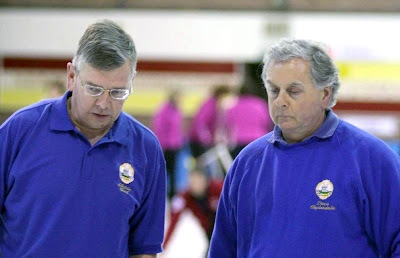 Prentice, Lockhart Steele, Robin Aitken and Tommy Fleming, the 2007 World Senior Champions, were into the Scottish final. 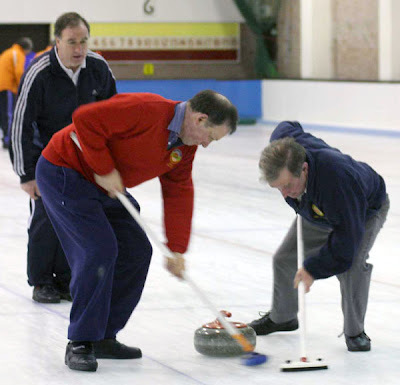 Colin Hamilton, Gary Macfarlane, Don Rutherford and Gordon Crawford were two up without, playing the last end against David Clydesdale, Alistair Wood, Jim Taylor and Douglas Rodger. Clydesdale rolled his first off a front guard behind cover. 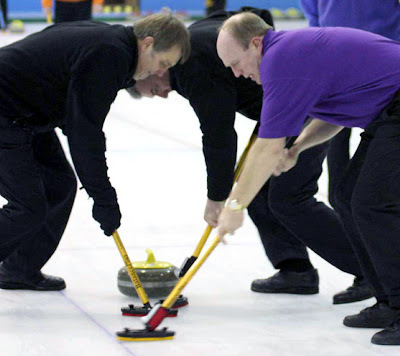 In trying to wick it away for the game, Hamilton edged his own front stone into shot position behind another guard. Clydesdale then had to play the run back, rolling the shooter into play to force the extra end. This he did. 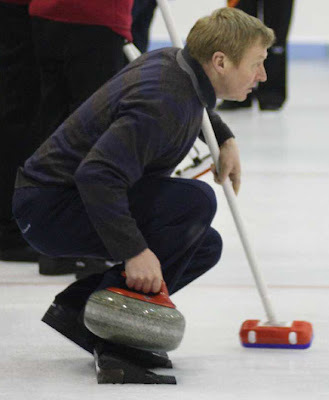 With his final stone of the ninth, Hamilton had to draw fully to the eight foot for a place in the final. He threw it well enough, but for a couple of sweeps more he would have made it. 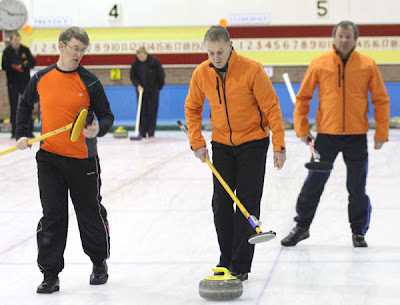 After a measure, it was Team Clydesdale which advanced. All the linescores are here. It's Pinocchio again! Irene Hird, Janette Wilson and Maggie Mauchline. Keith Prentice comes out to join Lockhart Steele and Robin Aitken. Good to see Robin has discarded the black bin bag look! Elaine Semple and Pat Ross work on Fiona Macfarlane's stone. 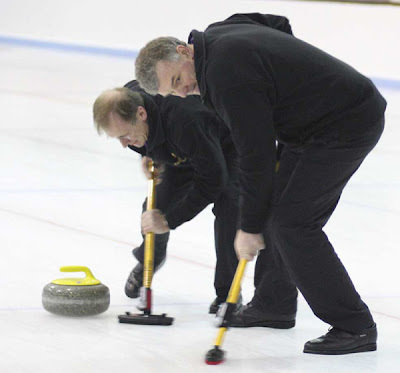 Bill Allison and John Wallace work on Gordon Mackie's stone. 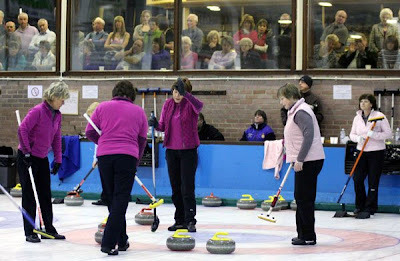 The rink got even busier as the semis progressed. 'I just can't bear to watch.' Other captions are available. 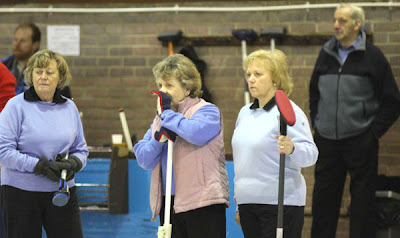 I was impressed that there were three Royal Club Directors on the ice this morning. Here is Lockhart Steele at work with Tommy Fleming. This reminds me. Nominations for two positions on the Board closed yesterday. I wonder if anyone wants to be a Director? 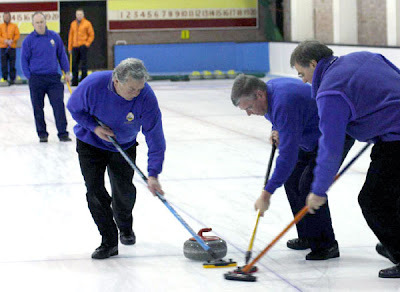 And I thought curling was supposed to be fun! Kay Gibb and Marion Craig. 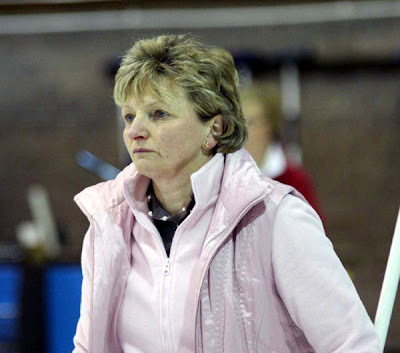 Here's another Director - Irene Hird! 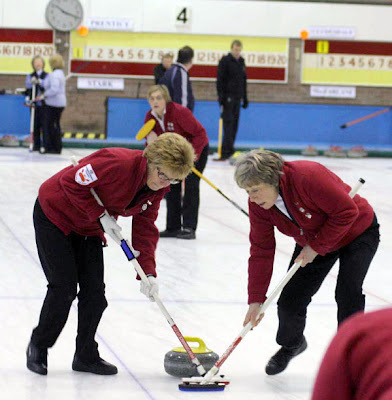 Anne Malcolm and Catherine Raeburn sweep Marion Craig's stone. 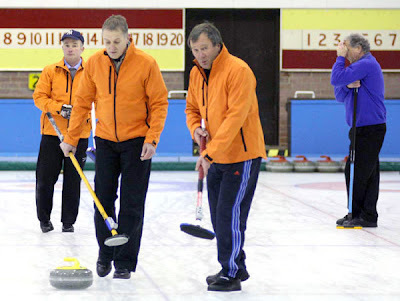 David Clydesdale joins his sweepers.